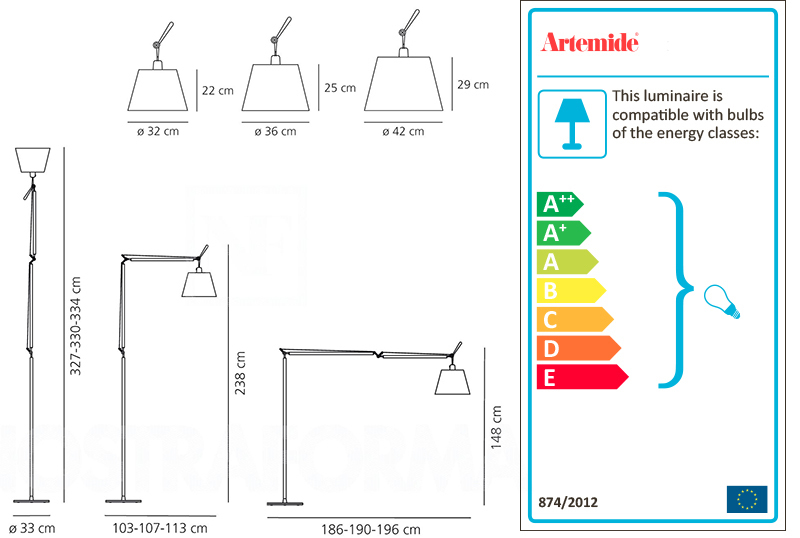 Artemide Tolomeo Mega Floor Lamp Ø 32 cm belongs to the homonym collection of lamps that is immediately become a best seller. It comes from the famous table lamp Tolomeo. A piece of admirable design for the lightness and the purity of the lines, appreciated for its everlasting actuality. Inspired to traditional models, Tolomeo is the new interpretation of the rubber lamps of the past interpreted with modern technologies and contemporary lines. The result is an innovative object Artemide Tolomeo Mega Floor Lamp Ø 32 cm belongs to the homonym collection of lamps that is immediately become a best seller. It comes from the famous table lamp Tolomeo. A piece of admirable design for the lightness and the purity of the lines, appreciated for its everlasting actuality. Inspired to traditional models, Tolomeo is the new interpretation of the rubber lamps of the past interpreted with modern technologies and contemporary lines. The result is an innovative object. Bulb not included, 1x150W Halo o 1x8W LED (E27). "